When chowing down on your char kway teow, observe proper Malaysian eating etiquette by using your right hand. From humble beginnings as peasant food, char kway teow was originally eaten by labourers as a cheap source of energy and nutrients, but has since evolved into one of Malaysia’s most-loved hawker dishes. The name itself originated from Hokkien, a Chinese dialect, and literally translates to fried flat rice noodles – the dish’s main ingredient. As Pauline Lee, founder of Simply Enak food tours explains, the noodles are typically combined with prawns, fish cake, garlic chives, bean sprouts, cockles and the secret ingredient: pig’s fat (“a bit like the bacon in pasta carbonara,” she tells us enthusiastically). 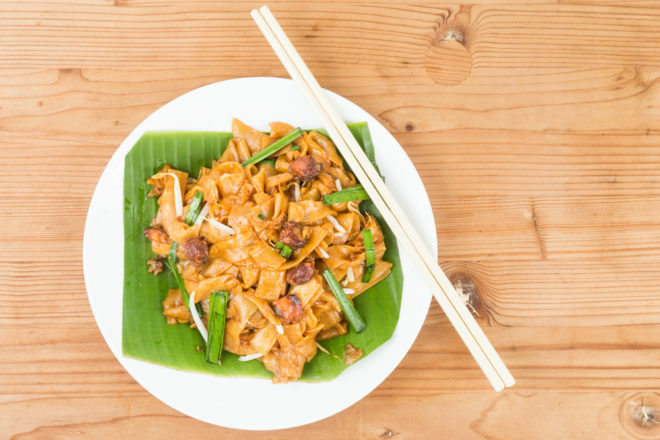 The trick to the perfect char kway teow is not only technique but, equally important, the heat of the fire – referred to as ‘wok hei’ (breath of the wok). “You can’t make this at home – it won’t taste the same,” says Lee. Once the sizzling and clattering of spatula against wok subsides, the end result is smoky, fragrant and irresistibly delicious –served freshly cooked and ideally eaten right away. A must-try dish when visiting Malaysia! Malaysia is a Muslim country and when it comes to eating there are a number of Malay customs it’s best to respect. Always use the right hand for eating: It is standard practice to use your right hand to bring food to your mouth, even when cutlery is being used. Avoid pointing with your index finger: If you are pointing at menus or a dish, use your thumb, with the other fingers folded in the palm of your hand, and always use your right hand to point.